No controversy here. 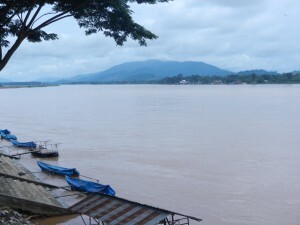 I’ve never heard anyone call Chiang Saen’s Wat Pa Sak ugly. The old town of Chiang Saen sits at a historic place on the Mekong–many ancestors of the Thai people crossed into this area when they migrated from the north. 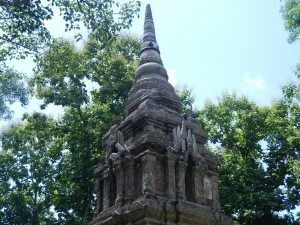 This neck of the woods had a lot of influence on the Thai culture that spread through the land. So it’s no accident that one of northern Thailand’s most beautiful stupas was built in Chiang Saen. Architects in many other monasteries imitated it, so it’s well worth a close look. 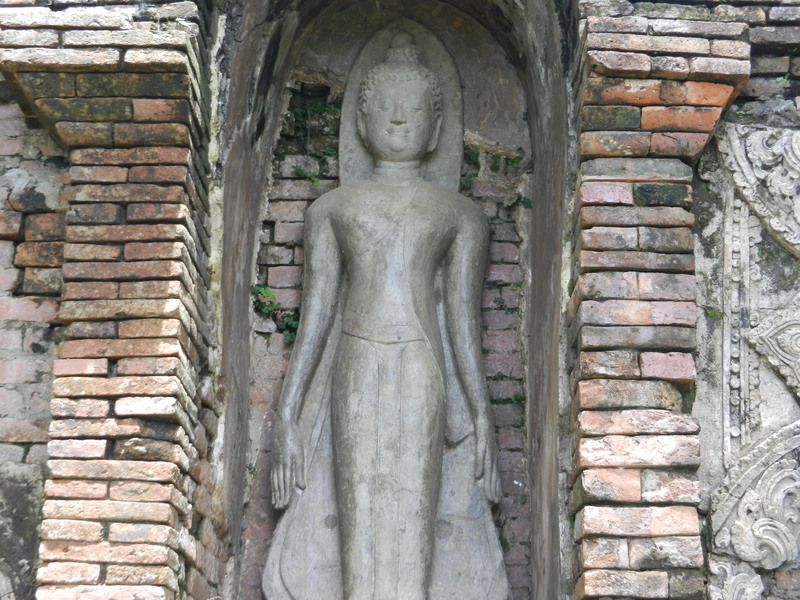 Wat Pa Sak was founded in the late 13th or early 14th century. 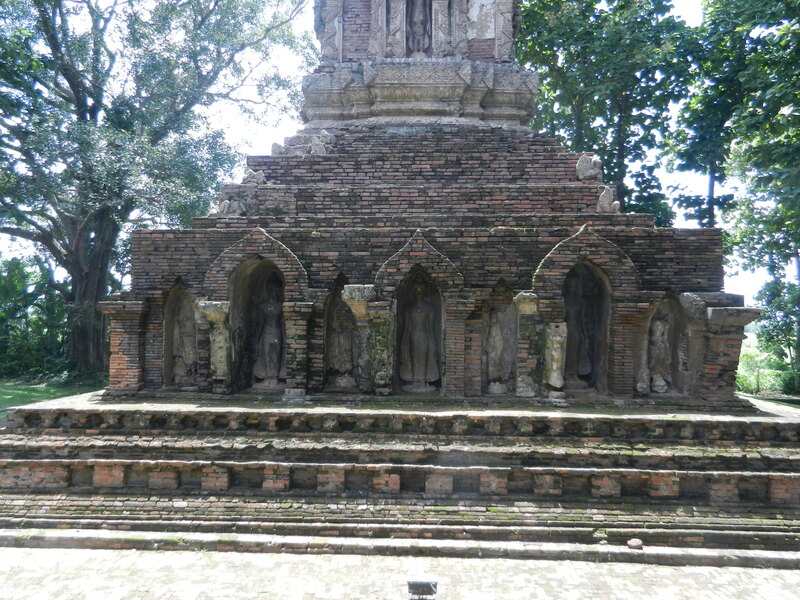 Its stupa was built to hold a relic from India. 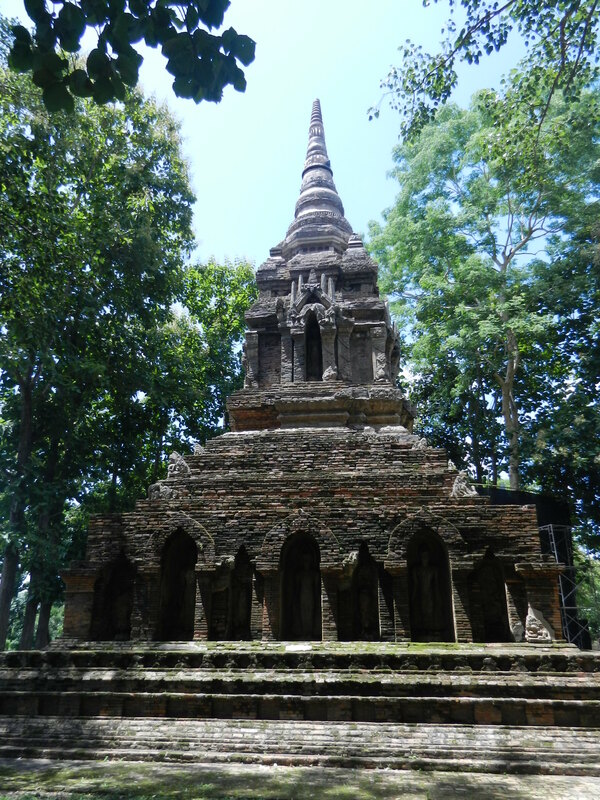 Many northern Thai stupas balance earthly solidity on the bottom with spiritual lightness at the top. Both domains smoothly transition into each other as though spiritual energy is coming from the heavens and taking on solid forms on Earth. The bottom’s massiveness and its niches’ forms evoke Pagan. The diminishing tiers with spaces for standing Buddhas were influenced by Mon architecture (They thrived in Thailand before Thais migrated and became the majority. Their language is related to Khmer). 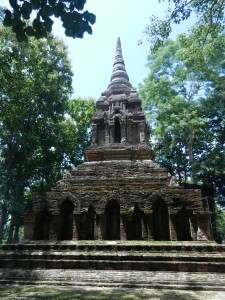 Here, we see the stupa’s crown playing with the trees’ foliage. 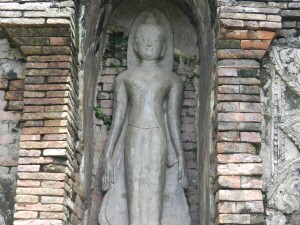 Wat Pa Sak means teak forest monastery. People originally planted 300 trees around its walls. Fine stucco work graces Wat Pa Sak’s stupa, and its style was influenced by Sukhothai. 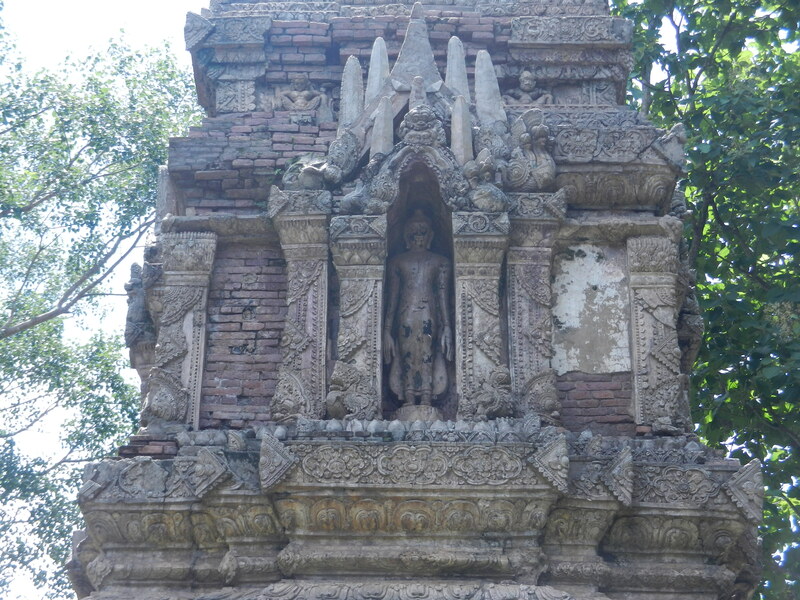 The Buddha statues that bless Chiang Saen from the niches are as graceful as the stupa. 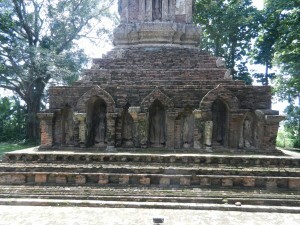 A slender vihara’s (public assembly hall) foundation stands in front of the stupa. 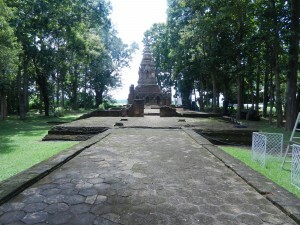 I’m looking from its entrance towards the stupa in the above photo. 1. The main cultures in Northern Thailand. 3. Architectural forms and nature’s vegetation. The multitude of life-forms in the world mix and become more graceful. To see another culture’s very different model of reality, check out Indian temples.